Our gliders and products are results driven by our own passion – same with the HIKE. 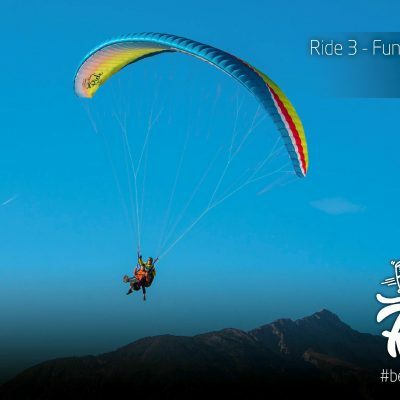 The HIKE enables you to share the emotions of hike&fly with others. Finally you can take your girl-friend, wife, friend with you and let them feel the sensation of a flight after a hike-up. 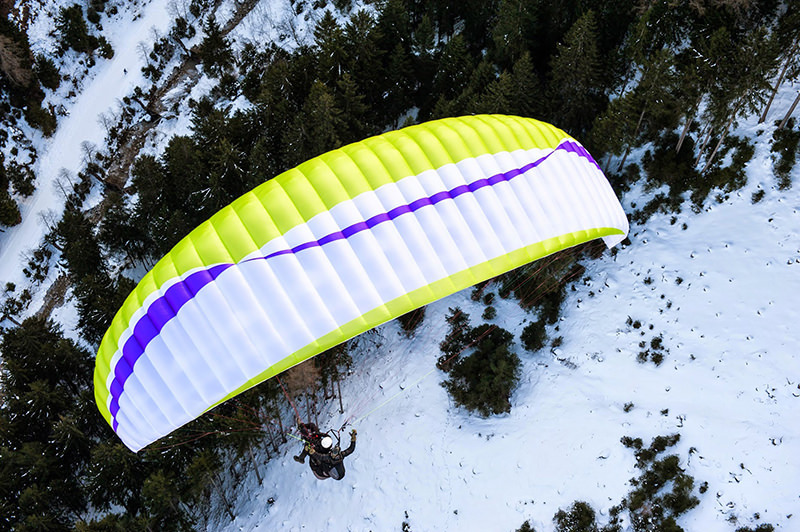 With a weight of only 5,3kg and a surface of 35m² the glider also packs small due to a simple construction of just 38 cells. The materials used are durable and light. At the leading edge we chose the well-proven D30 from Dominico. At other less stressed areas we use the Porcher Skytex 27 classic II with double coating. This material makes the glider light and small to pack. The ribs are a combination of Skytex 32 or 27, depending on the strength required All lines are unsheathed to save weight. As the HIKE is very light, take-off is very easy. Only little effort is required to rise the wing from the ground, and the lifting-off is also as easy. Even in non-perfect conditions the glider inflates and rises well. The handling is very agile and precise. Already little brake input turns the HIKE into thermals and the gliders remains centered almost automatically. The handling is 100% fun. Even with lower loadings the HIKE is agile, responsive and fast. So flying with children is great fun. 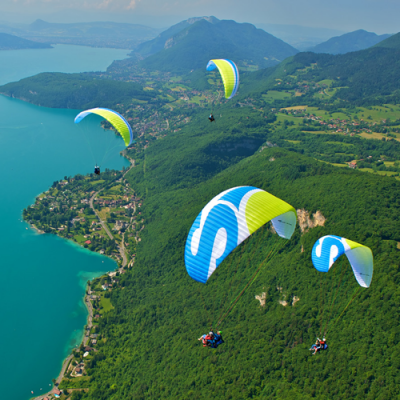 The combination of the ease of flying and glide performance are comparable with solo-wings in the mid EN-B range. When landing the HIKE flairs very well. Even in zero-wind conditions and with heavy loadings it is possible to land on the spot (flairing technique required). HIKE is produced in SUPERLIGHT version only and in colour scheme LITE. Of course it is possible to order individual colour combinations. The SuperLight edition can be customised with a different colour leading edge and design stripes. The main top and bottom surface is offered in white.